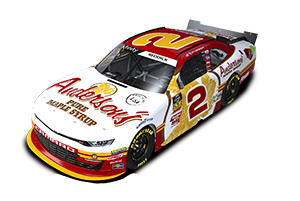 Anderson's Maple Syrup, Inc. and Nascar Nationwide Series team Jay Robinson Racing again teamed up in the Nationwide Series on August 26th at the world renowned Bristol Motor Speedway in Bristol, TN, with Nascar and short track veteran Dennis Setzer driving the #23 Chevrolet. The race was broadcast live on ESPN, but things didn't go well from the start. Setzer qualified the car in the 32nd position, and was turning in some very fast laps and passing several slower cars to start the race. While under caution however, the team decided to pit, but a costly pit road penalty forced them to the back of the field, putting them one lap down. Shortly after the restart, Setzer radioed to the team that there was something wrong with the front end. After numerous green flag pit stops, the team determined there was an issue with the car that comprised Setzer's safety, so they decided to park for the evening, resulting in a disappointing 32nd place finish, 113 laps down.